I come from a big Irish family so when asked to photograph an equally large family, I’m always up for the challenge. I arrive to the session with a plan of attack as we work toward sunset time (depending on ages, bedtimes, meltdown potential, etc.) and am ready to wrangle a big group–high energy is the key! With groups of 8+, I’d estimate that everyone is looking at the camera with their eyes open in about 10% of the photos that I take–no matter how much I try! The solution? Just take a lot so you have options! Keep the group laughing, jump up and down, and bring squeaky toys for the babies- whatever you’ve got to do! Thus, I was excited when the Diamond family contacted me to take beach portraits of their group of 10, ranging in age from 6 months to 90. I’ve known the Diamonds since high school and it’s always fun to see how a family has grown and changed. 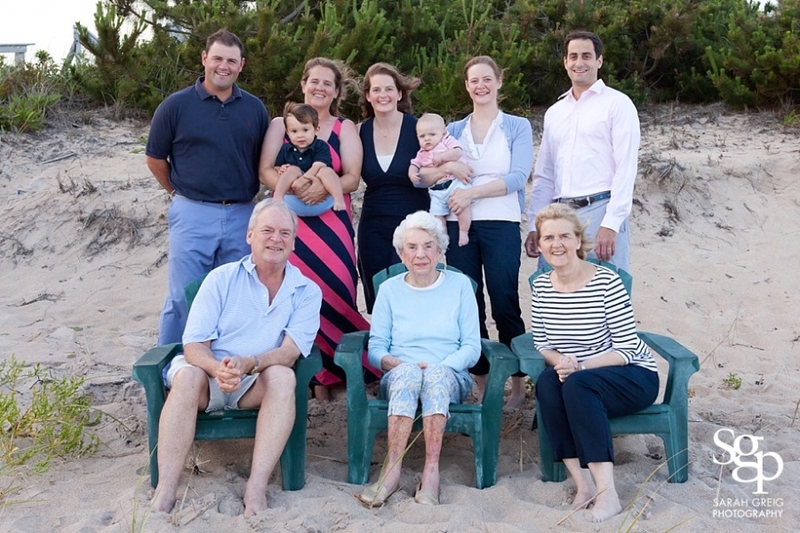 We met at their family home in Westerly, RI, which has a gorgeous walkway leading down to the beach. We lucked out with beautiful mid-summer light but battled some fierce wind, which is never easy for the gals in the photos! After the large group shot, we were able to break down into some smaller groups to capture the little cousins and their families. 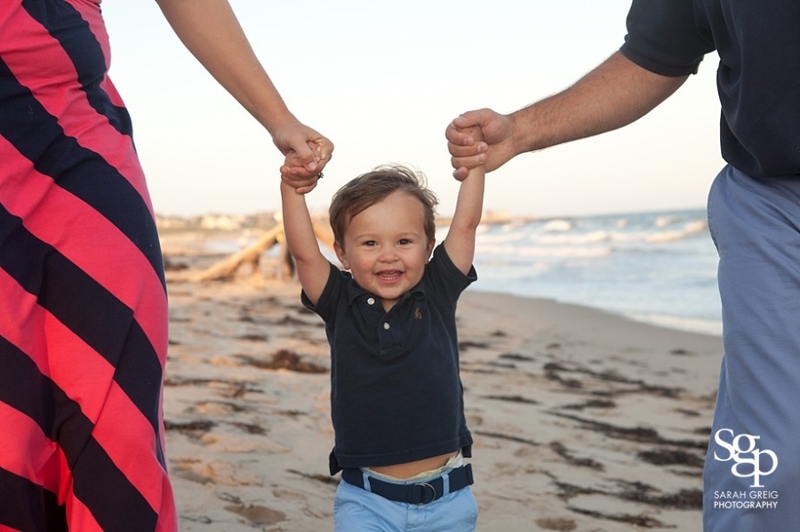 Davis just turned 2 and is the son of college coaches–football for dad and lacrosse for mom–his mom was my soccer goalie in high school and college! I always ask families of toddlers to bring some fun props for the session, and Davis’ latest love is golf. They brought along his set of clubs and a football, and we had a blast recording his laughter and clear athletic skill! Thomas, his little cousin, will certainly be joining in the fun next year, but this year I had the joy of capturing snuggles with mom and dad (it was nearing his bedtime) as well as his amazing blue eyes. 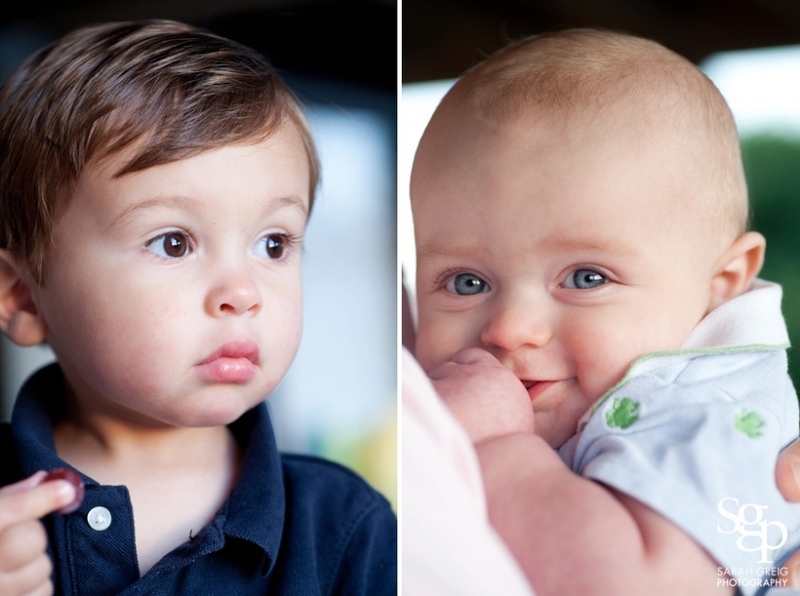 We also took a few fun images of the boys with their Aunt Paige, who clearly adores them! I wrote a few months ago about the importance of recording a family as it grows and changes. I love families who understand the value of this. It’s not easy to gather three adult children, their spouses, babies, grandmother, and parents all in one place at the same time, but in the end I believe that it’s so worth it. Diamonds, it was such fun to work with you and hope to see you all again soon! Deep blue hydrangeas, boathouse water reflections in golden light, a kelly green canoe, and a sunset view from a beautiful dock…this session location was a photographer’s wonderland! And with an adorable family to boot! Though it had poured for parts of the day leading up to our session, the skies cleared just in time and mother nature gifted us with one of the prettiest nights of the summer. When I showed up to photograph Zachary and meet his family, I didn’t have to worry about breaking the ice–he was excited to see me and told me he had “lots of ideas” for our photo session. I liked his style! We struck a deal to do a few of his ideas along with a few of mine, and from covered porch to wooden dock, we had a blast and captured some great images (and those BLUE eyes, wow!). Thanks D, E, and Z for your spirit and smiles–I hope these images bring you back to summer days! A surfboard, sand, smiles, and sunset are a great combo for a summer beach session! I adored working with these little ladies and their mom. I caught the Nutting family on Nantucket just two days before they moved to California, so naturally we found a surfboard to use during some of the session (ok, they’re moving to Northern CA, but people do surf there in wetsuits among the sharks!) When working with three children, someone is always running in the opposite direction or doing their own thing, but with a little help from mom and grandma (and maybe some promises of Swedish fish), we captured genuine laughter and had lots of fun. I also have two sisters and loved recording the familiar interactions between these three–ranging from love to annoyance–and of course lots of admiration for each other. We kicked off the session in front my favorite blue doors at Sankaty Head Beach Club (they just scream “summer” to me!) and continued down on the beach in the golden light of sunset with the ever-eroding Siasconset bluff as a gorgeous backdrop. This family is welcoming child #4 this winter and I found some appropriate beach buckets to photograph with the gals and mom’s tummy! S, C, H, and B, it was so much fun to work with you–I can’t wait to meet your new addition next summer! I’ve been working on a new project for the last, oh, 8.5 months…Baby #2. In some ways this pregnancy has flown by; while in other ways, it seems to have gone on forever. This time around, I feel bigger (and have that waddle walk that I never had with my first), my hips are killing, and I’m up writing this at 1am because I just don’t sleep much anymore. I know, I know, I better get used to the not sleeping part again! Schlepping my camera equipment and gathering up the manic energy needed for 6pm family portrait sessions this summer was tougher than I thought it would be, as was walking up to our fourth floor apartment (it usually necessitates a long pause on the second floor and a belly hold for the last two flights). With + or – 3 weeks to go, I’m filled with a lot of emotions: excitement at meeting this young guy or gal, trepidation at the reality of having two children, and frustration that we are creatively trying to cram a fourth person into our 1.5 bedroom elevator-free apartment. I’m starting to have flashbacks to my last delivery, which somehow I was able to block out of my head for the last 3 years. Let’s just say it began with a surprise induction and did not end smoothly. I never tell anyone about it unless they’ve already had children. 🙂 But a friend of mine who just delivered her second child reminded me of the power of positive thinking, so here’s to hoping (praying!) for a better experience this time around. Since I’m always preaching about the importance of recording life’s big moments, I hired a photographer to take maternity portraits of me this week. It’s always strange for me to be in front of the camera, but I don’t want this moment to slip by without a proper record of it. Clearly my sunrise self-timer “selfie” above during a sleepless morning in Nantucket will not suffice! I also love working with other photographers and seeing how they interact with clients, run their business, etc. We can all learn from each other. I’ll keep you posted on how it goes! In the meantime, back to my waddle, my pineapple popsicles, and my growing belly. Here’s to being up before the sun, new pathways, and a cute newborn to photograph in a few weeks! 5:45 am at Brant Point Lighthouse, Nantucket, MA. I’ve been such a lazy blogger this summer but that’s mostly because I’ve been on the road and out enjoying the summer! June and July consisted of eating s’mores, chasing seagulls, exploring new cities, boating at sunset, biking on wide deserted beaches, shooting beach sessions and events, hunkering down in a hurricane, and watching my baby belly grow larger and larger (more to come on that). All of that fun also brings lots of time in the car and on planes, schlepping of equipment to and fro, and a huge amount of packing, unpacking, and re-packing. But from Charleston/Kiawah to Nantucket and Rhode Island, I’ve been photographing my heart out. I have a backlog of images to share, but here are a few that make me smile and think SUMMER. Happy mid-August (can you believe it?)!! © 2019 Sarah Greig Photography|ProPhoto4 Blog by NetRivet, Inc.